Experimentalists and theorists who are not experts in modeling, but who seek to initiate a project that requires advanced modeling, stand to benefit from a workshop where they can receive advanced training and consultation on their ongoing molecular dynamics study. 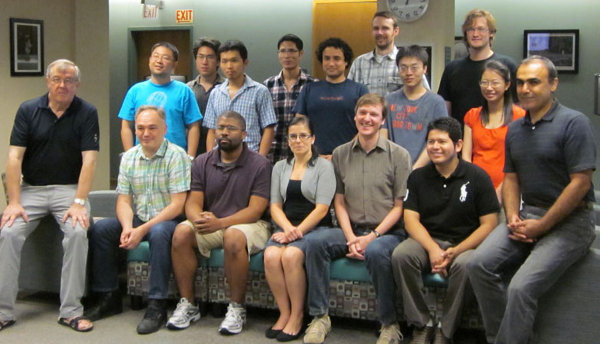 The Theoretical and Computational Biophysics offered a two-week workshop, held July 16-27, 2012, meant to facilitate launch and refinement of participant modeling projects. At the home offices of TCBG, five participants were provided with office space, use of computing facilities at the TCBG, and access to the expertise of TCBG group members, with the goal of advancing their molecular modeling projects. The workshop was supported by NIH grant P41-RR005969 "Resource for Macromolecular Modeling and Bioinformatics". Contact Us // Material on this page is copyrighted; contact Webmaster for more information. // Document last modified on 01 Aug 2012 // .